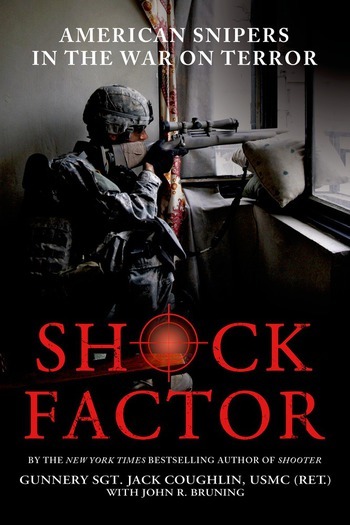 From the author of the New York Times bestselling memoir Shooter, comes a riveting narrative of how snipers have changed the course of America's war on al Qaida in the Middle East and Africa. Retired Marine sniper Jack Coughlin (Shooter) and John Bruning pull back the curtain of secrecy to take an insider's look at the dark and misunderstood world of America's sniper force. Long considered the redheaded stepchildren of the infantry, snipers have been loathed by their fellow warriors, called "ten cent killers" by our media, and portrayed as unbalanced psychopaths by Hollywood. Coughlin and Bruning explore the lives and careers of some of America's most effective snipers during key missions, moments and campaigns in the War on Terror. Part page-turning thriller, part deeply human drama, Shock Factor takes you from the streets of the modern day "Stalingrad" of Ramadi to the skyscrapers of Baghdad as America's one-shot warriors fight desperate battles against all odds, find themselves at the heart of tense international incidents, stalk key enemy leaders, and discover horrific human rights abuses perpetrated by our own allies. Based on extensive interviews with snipers currently on active duty, Shock Factor's gripping accounts of harrowing combat, buried truths and secrets revealed could only be told by snipers to a trusted member of their own elite and cloistered brotherhood. GUNNERY SGT. JACK COUGHLIN is the New York Times bestselling author of the autobiography, Shooter (with Donald A. Davis). He served with the Marines during the drive to Baghdad and has operated on a wide range of assignments in hot spots around the world. JOHN R. BRUNING is the author or coauthor of fifteen nonfiction books. He received the Thomas Jefferson Award for Journalism for an article he wrote while embedded with the 3rd Combat Aviation Brigade in Afghanistan.